8 THE SHOP NOVEMBER 2018 Also, if at some point in the future they decide to change it back—or before they sell it to someone else—they might come back and pay you to put it back to the original stock configuration. That means there's a business opportu- nity for professional shops to capitalize on this emerging and growing market seg- ment. 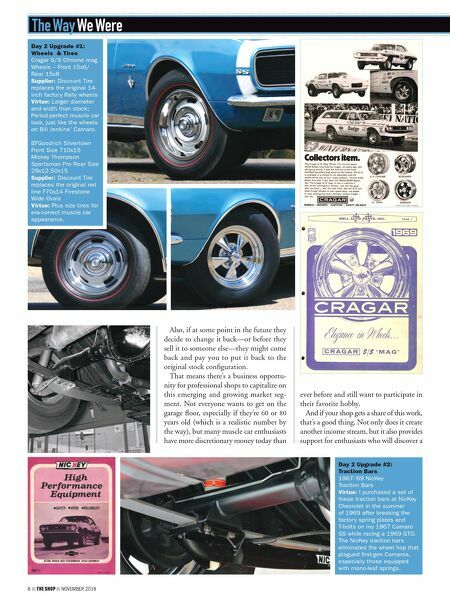 Not everyone wants to get on the garage floor, especially if they're 60 or 80 years old (which is a realistic number by the way), but many muscle car enthusiasts have more discretionary money today than ever before and still want to participate in their favorite hobby. And if your shop gets a share of this work, that's a good thing. Not only does it create another income stream, but it also provides support for enthusiasts who will discover a The Way We Were Day 2 Upgrade #1: Wheels & Tires Cragar S/S Chrome mag Wheels – Front 15x6/ Rear 15x8 Supplier: Discount Tire replaces the original 14- inch factory Rally wheels Virtue: Larger diameter and width than stock; Period-perfect muscle car look, just like the wheels on Bill Jenkins' Camaro. BFGoodrich Silvertown Front Size 710x15 Mickey Thompson Sportsman Pro Rear Size 29x12.50x15 Supplier: Discount Tire replaces the original red line F70x14 Firestone Wide Ovals Virtue: Plus size tires for era-correct muscle car appearance. 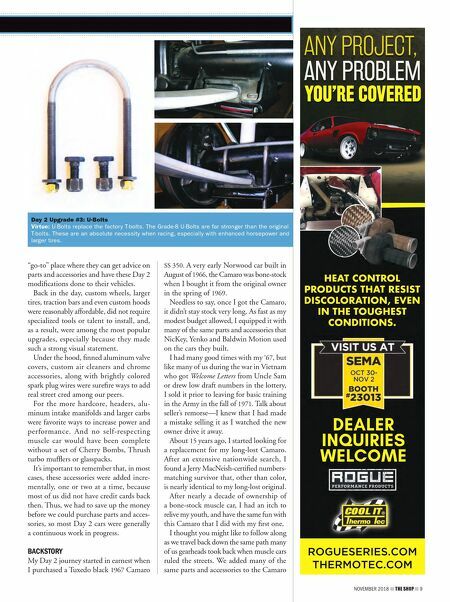 Day 2 Upgrade #2: Traction Bars 1967-'69 NicKey Traction Bars Virtue: I purchased a set of these traction bars at NicKey Chevrolet in the summer of 1969 after breaking the factory spring plates and T-bolts on my 1967 Camaro SS while racing a 1969 GTO. The NicKey traction bars eliminated the wheel hop that plagued first-gen Camaros, especially those equipped with mono-leaf springs.